This super easy handwriting trick is one that can be done right now. Pick up your phone, turn on the timer app and start practicing handwriting. 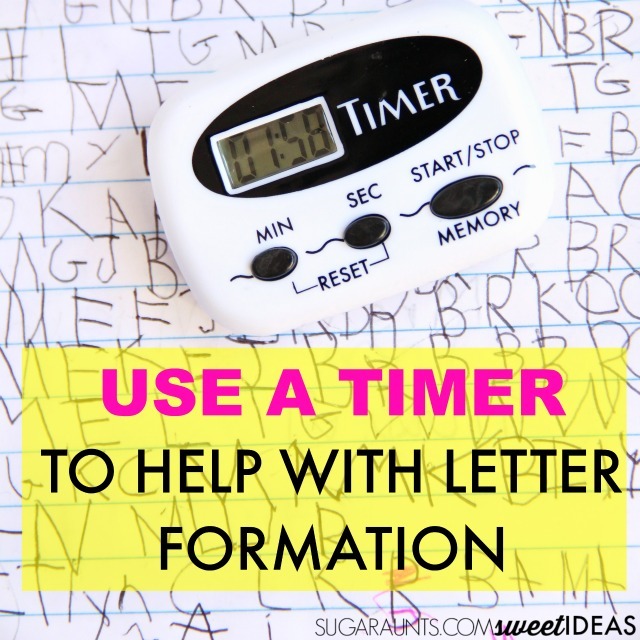 Using a timer to help with letter formation is one way that kids can develop consistency with correct letter formation, speed, and accuracy (with a goal of handwriting legibility!) when completing writing tasks independently. who are working on handwriting are often times addressing letter formation skills. The ability to construct letters stems from a top to bottom approach and in correct letter formation order. For example, a child should not be writing a letter in sections or with unnecessary re-trace. Many times you see preschool children form letters by sections and not constructing the letter correctly. These inaccuracies can be carried over to the later grade years and will absolutely interfere with legibility as the child is required to write more, at faster speeds, and in smaller spaces. Addressing correct letter formation is a must for legibility. So, the child who needs to work on "building" correct letter formation can typically perform these tasks when working one on one with an individual who provides differing levels of support. These might include verbal cues, visual cues, and physical prompts. But how is the child to transition from varying percentages of cues to more independence in their written work? A timer is an easy tool to use in this instance. I love to grab a kitchen timer for practicing written work. While a phone timer is great, the phone itself can be a distraction for kids. A small timer that fits into the palm of the hand is perfect for the clinician's therapy bag or for fitting into a desk pencil box. This one has a magnetic back, making it convenient to stick to metal desks. However, a phone timer or the good, old microwave timer will do the job too. Timer Tip: Some kids can become hyper-focused on the time as it counts and will stare or become anxious about the time as they watch the numbers change. A wind-up kitchen timer can help in those cases. You will need to count down to figure out the time spent on a handwriting task. 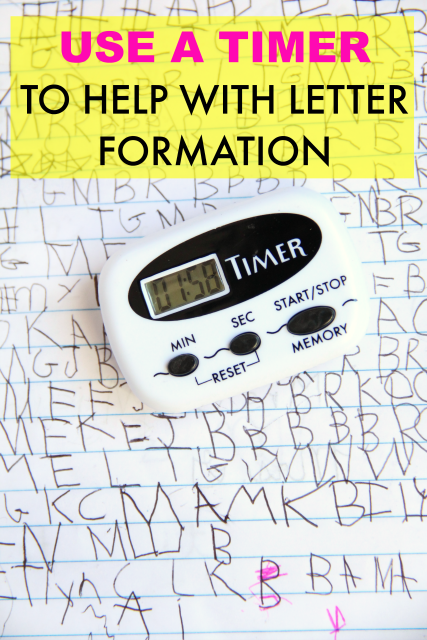 This timer trick works best with kids who are working on letter formation and can form letters accurately and with correct formation with extended time, modifications, and/or added cues. Tell your child that you are going to turn on the timer to count how long it takes them to copy a line or sentence with accuracy. Then, try to beat that time while maintaining accuracy with correct letter formation. When kids are rushed to complete written work, they tend to speed up and return to comfortable, bad handwriting habits. Using the timer to copy one line with a goal to beat their own time is a motivating way to encourage carryover of appropriate skills. Use a timer to work on speed. For the child that writes very slowly or becomes overly focused on letter formation, use the timer as a countdown to improve speed and accuracy. Mark each trial with time and correction errors. Set the timer for handwriting time. This is a good way to get kids who are not motivated to work on handwriting skills. Small rewards such as choosing a fine motor or visual perception activity between writing trials can be reward options.